Home Page | Embassy of the Principality of Liechtenstein in Washington, D.C.
You might have noticed that for the past several months the Embassy of Liechtenstein has been incorporating a special logo on its website, social media and e-mails stating "300 Years Principality of Liechtenstein 2019." As you may have deciphered, 2019 will mark the 300th anniversary of Liechtenstein’s founding. This momentous occasion will be celebrated with various events and activities throughout the year, presenting a unique opportunity for Liechtenstein to highlight its rich history while looking forward to a promising future. In its February/March 2019 issue, National Geographic Traveler featured Liechtenstein’s capital of Vaduz as a “Smart City” for its commitment to accessing clean energy. In 2018 Liechtenstein once again topped the list of per capita production of solar energy by the organization SolarSuperState. On March 18, 2019 the Organization for Economic Cooperation and Development's (OECD) Global Forum on Transparency and Exchange of Information for Tax Purposes (Global Forum) found that the legal framework and practice in Liechtenstein are to a large extent compliant with international standards on administrative assistance in tax matters. In its second-round peer review, Liechtenstein again received an overall rating of "Largely Compliant" (in the same category as the United States, Germany, the United Kingdom and Austria). On April 8, 2019 students from the International Music Academy in Liechtenstein will play a concert at the Kennedy Center's Millennium Stage in Washington, DC. The event will begin at 6:00 p.m. and is free of charge. The listing of the concert can be found here. The second annual Liechtenstein Dialogue for Development (LDD) took place at the headquarters of the Hilti Group in Schaan on January 17, 2019 and brought together a group of about 90 government and business decision-makers, subject matter experts as well as young professionals from across sectors and geographies. On June 27 Ambassador Kurt Jaeger traveled to Charlotte, NC to visit the Liechtenstein company Neutrik USA. Neutrik is a global leading supplier of professional entertainment connector products such as audio, video, digital, and fiber optic connectors. In the US the company employs 20 people and globally has a staff of about 1,000. On September 12 the Embassy of Liechtenstein and Center for Strategic and International Studies (CSIS) held a panel discussion on the future regulatory challenges of blockchain technology. The discussion was moderated by William Reinsch, Senior Adviser and Scholl Chair in International Business at CSIS. The panel included Mr. In the midst of the refugee crisis four years ago, representatives of various religions met at the Berlin residence of H.S.H. Prince Stefan of Liechtenstein, the Ambassador of Liechtenstein to Germany at the time. During the meeting, participants discussed ways to improve the linguistic integration of refugees into European society. The final product of the meeting was the creation of a language course project named ‘Liechtenstein Languages’, also called LieLa for short. Tina Weirather’s Olympic success in winning a bronze medal in the Women’s Super-G skiing brought joy to the Principality unparalleled since Paul Frommelt won Liechtenstein’s last medal in Calgary in 1988 in men’s slalom. In mid-March Aurelia Frick, Minister for Foreign Affairs, Justice, and Culture, visited the United States to meet with officials in New York and Washington, DC, and to officially open a new Honorary Consulate in Houston, Texas. Prime Minister Adrian Hasler outlined his vision for Liechtenstein’s future as a leader in the world of blockchain financial systems by announcing new regulations on blockchain systems at the Finance Forum Liechtenstein. Arno Oehri’s film “Open Land – Meeting John Abercrombie” succeeds in more than just connecting the audience to the American jazz legend it portrays, it also succeeds in connecting Liechtenstein to the global jazz community. Oehri, a native of Liechtenstein, was invited to show the film at festivals in Madrid, Kassel, and Sarajevo. Liechtenstein’s Delegation to the 2018 Olympic Winter games in PyeongChang, South Korea, has arrived and is readying for the games’ opening ceremony on February 9. The principality will be represented by three athletes, with Tina Weirather and Marco Pfiffner to compete in alpine skiing, and Martin Vögeli to compete in cross-country skiing. Ivoclar Vivadent is one of the world’s leading dental companies, supplying high-quality products to dentists and dental technicians, and a global leader in the manufacturing of ceramic teeth and prostheses. November 20-21 Ambassador Kurt Jaeger visited the North American headquarters of Ivoclar Vivadent in Amherst, New York. Ambassador Jaeger was received by the company’s top leadership including CEO Bob Ganley. On September 18, the think tank Women in International Security (WIIS) and the Embassy of Liechtenstein launched a roundtable series on security and gender challenges. The Gender, Peace, and Security series provides a forum for bringing together a diverse group of experts and policymakers to advance gender considerations in security policy discussions. During his soccer career Nicolas Hasler has played for Vaduz, Triesen, Balzers, and Eschen – all of them towns in Liechtenstein. Then he got a call from Toronto FC. One week later he left his home country and has been playing in North America's Major League Soccer (MLS), culminating in the December 9 win of the MLS Cup. On October 23, Martin Frommelt became the first Liechtenstein artist to display his work at the National Gallery of Art (NGA) in Washington, D.C. Curator Jonathan Bober was delighted to add Frommelt’s Creation to the NGA’s graphic collection. Kaiser’s Chophouse, in Sandy Springs, GA, just north of Atlanta, offers quality cuts of meats, superior ingredients, and a boutique wine and cocktail program. Growing up in Liechtenstein, the restaurant’s chef and co-owner fell in love with cooking in one of Liechtenstein’s most renowned restaurants. On November 1 Dennis Houston began his post as Honorary Consul of Liechtenstein in Houston, TX. 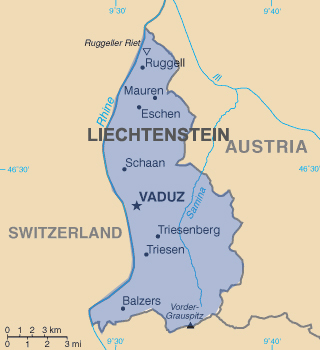 It marks the first time the south-central region of the United States is covered by a Liechtenstein honorary consulate. The consular district of the new consulate will encompass the states of Texas, Arkansas, Louisiana, New Mexico and Oklahoma. On October 25 the Embassy of Liechtenstein, in cooperation the Center for Strategic and International Studies (CSIS), held a panel discussion on human trafficking titled “Ending Modern Slavery.” The discussion featured remarks by US Senator Bob Corker of Tennessee who serves as Chairman of the Senate Foreign Relations Committee. Today, on this World Day against the Death Penalty, we reaffirm our commitment to the universal abolition of the death penalty. On the positive side, we have been witnessing a worldwide trend towards restricting and abolishing the death penalty for decades. Of the 193 UN member states, only 36, or just under 20%, still apply the death penalty. Since opening its embassy in 2002, Liechtenstein has sought to develop an active and engaged relationship with the United States at all levels, be they political, economic, cultural or academic. Click here for more information.